Here we go again - our Books of the Year round-ups of lists from the media in 2011 and 2010 were very popular, and this is our (frequently updated) one for 2012. You can also join in by nominating your own book of the year - we're blogging these. Take five minutes to fill in this form. 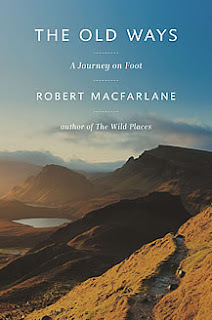 The Observer's first choice, by John Banville, was a very popular title this year in many publications - Robert Macfarlane's The Old Ways: a journey on foot. Other choices include Sally Gardner's Maggot Moon (from Adam Mars-Jones) and Canada by Richard Ford (Sally Vickers). The excellent Gutter Bookshop in Dublin has a Christmas selection, including John Banville's new novel Ancient Light, and Laurent Binet's well-received HHhH, about the Nazi Reinhard Heydrich. The Irish Times Top Titles of 2012 sees John Connolly also pick out Laurent Binet's HHhH, and Catriona Crowe choose Harry Clifton's latest poetry collection, The Winter Sleep of Captain Lemass. The Guardian's list, chosen by authors such as Chimamanda Ngozi Adichie and Richard Ford, includes the latest volume of Robert Caro's astonishing biography of Lyndon Johnson, The Passage of Power (chosen by Robert Harris), which covers the assassination of JKF and Johnson's assumption of the Presidency. Best History Books chosen by David Horspool include The Victorian City by Judith Flanders, a recreation of everyday life in Dickens's London. The best children's books for 8-12 year-olds starts with Jon Klassen's sequel to his successful I Want My Hat Back, This is Not My Hat. Best Crime includes Gillian Flynn's often-mentioned Gone Girl. Also, their annual feature The Publishing Year looks at books publishers 'loved and lost' - Chris Hamilton-Emery of Salt writes that "Without doubt the book that had the biggest impact on Salt was Alison Moore's Man Booker-shortlisted The Lighthouse, a novel that transcends genre while playing with genre motifs, providing dark humour as well as a deliciously transgressive view of fate and the horrors of recursive human experience." The Daily Telegraph: the Christmas selection by authors includes Zadie Smith's novel NW (chosen by Philip Hensher), and Hilary Mantel's Booker-winning Bring up the Bodies (Robert Douglas-Fairhurst). Also, Nicholas Shakespeare selects the best biographies, including Oliver Matuschek's Three Lives: a Biography of Stefan Zweig. Here, Tom Payne chooses his poetry books of the year, including Andrew Motion's The Customs House. Gaby Wood reviews the year in literature here. The Sunday Telegraph also has a selection by critics and guests, including Jan Morris (the frequently-cited Artemis Cooper biography of the travel writer Patrick Leigh Fermor) and Anne Chisholm (Rose Tremain's follow-up to Restoration, Merivel). The School Library Journal each year provides one of the best-informed lists of children's books. The list is broken down into categories, including in fiction Son by the well-known children's writer Lois Lowry. The National Science Teachers' Association in America has a fine list of the best science books of the year for secondary pupils. The Washington Post's 10 Best Books of the Year include Katherine Boo's widely-acclaimed account of three years spent in the slums of Mumbai, Behind the Beautiful Forevers and Richard Ford's Canada (which is likely to be mentioned often in these lists). They also have 50 Notable Works of Fiction (including Mario Vargas Llosa's treatment of the life of Roger Casement, Dream of the Celt), 50 Notable Works of Non-Fiction (including Richard Russo's memoir of his mother, Elsewhere) and Top 10 Graphic/Comics Read of 2012, with Chris Ware again to the fore with Building Stories. The Wall Street Journal offers History books. The New York Times: 100 Notable Books of 2012 in fiction, non-fiction and poetry includes the final volume of Edward St Aubyn's brilliant Melrose series, At Last and, recently published in the US, the hugely talented Kevin Barry's City of Bohane. And there's also the 10 Best Books of 2012, including Chris Ware's boxed graphic novel Building Stories and the great Robert Caro again on Lyndon Johnson. The Slate staff picks for 2012 include Louise Gluck's Poems: 1962-2012 and (twice) Katherine Boo's Mumbai book. They have also posted the Overlooked Books of 2012, including the Australian novelist Gerald Murnane's Inland. Atlantic magazine's Books of the Year 2012 features its top 5 and the runners-up. One of its top picks was actually first published a long time ago - Molly Keane's superb Good Behaviour. A runner-up is Alice Munro's latest, Dear Life, which features often in these lists. Also in The Atlantic there is a feature 'The Best Book I Read This Year' by editors and contributors: Scott Stossel goes for Edward St Aubyn's extraordinary Melrose series five-partner, now complete with At Last. Times Literary Supplement: Books of the Year 2012 has choices from 47 authors, including = Edna O'Brien's memoir Country Girl (chosen by Hilary Mantel) and Kevin Barry's excellent new collection Dark Lies the Island. NPR (National Public Radio) has several lists by its critics here; the short story recommendations include Nathan Englander's much-noticed What We Talk About When We Talk About Anne Frank, and Sherman Alexie's new and selected collection, Blasphemy. The New York Public Library has a fine list of children's books from 2012 - '100 Titles for Reading and Sharing'. Stories for Older Readers include Barbara Wright's Crow. Amazon.com's list of the Best Books of the Year includes the award-winning The Yellow Birds by Kevin Powers and Ian McEwan's new novel Sweet Tooth. The Yellow Birds also features in the Huffington Post's interesting selection by its editors,as does Brian Evenson's post-apocalyptic thriller Immobility. The London Independent's lists include Audio Books of the Year, Literary Fiction (J.K. Rowling's adult debut The Casual Vacancy is mentioned), Teenage Fiction (an interesting selection by Susan Elkin) and Art Books. A list of all their lists is here. One of the most comprehensive and interesting selections around is from the Financial Times, which of course starts with the Economics and Business categories category but then goes on to cover almost everything else, including history, politics, sport, art , music, film, fashion, travel, food, gardens and fiction (Pat Barker's Toby's Room, Barbara Kingsolver's Flight Behaviour). The St-Louis Post-Despatch has Our favorite books of 2012, including Michael Chabon's Telegraph Avenue, and of course Robert Caro on LBJ, again. The New Stateman's Books of the Year 2012 is a big selection from well-known authors and critics. Christopher Ricks recommends an American poet not well-known over here, David Ferry. The excellent Brainpickings site from Maria Popova has Best Art Books of 2012 including a stunning Alice's Adventures in Wonderland by the Japanese artist Yayoi Kusama. The London Evening Standard's Books of the Year 2012 has Jane Shilling recommending Peter Carey's new novel, The Chemistry of Tears. The reading social network Good Reads 2012 Choice Awards resulted in over 1 million votes, with J.K.Rowling's The Casual Vacancy heading the fiction list. The Sydney Morning Herald's 'year in books' features Thomas Kenealy's choice of Patrick White's first novel Happy Valley, recently republished, and Montebello, the new memoir from Robert Drewe, author of the superb The Shark Net. Bookriot's 5 Top Most Overlooked Books has at number 1 Joe Meno's Office Girl, about "two 20-something Chicagoans." And their contributors' Best Books of 2012, including Javier Marias's extraordinary sequence Your Face Tomorrow. The Library Journal's staff choice for 2012 includes John Sutherland's Lives of the Novelists: a history of fiction in 294 lives. Chicken Spaghetti has a very helpful and comprehensive list of children's books of the year, including awards. The Independent on Sunday has several lists: poetry (including Carol Ann Duffy's 'unabashed fan-girl' Sylvia Plath selection), biography and memoir, page turners (Gone Girl again) and children's picture books. The Printers Row journal on the Chicago Tribune has 19 Chicago booklovers (with photo portraits) recommending the books they loved this year. Novelist and lawyer Scott Turow goes for Ben Fountain's Billy Lynn's Long Halftime Walk. The Reading Matters blog from @kimbofo has several posts surveying other book bloggers' books of the year, nicely laid out (click on the covers for the review). One example: KevinfromCanada goes for Tony Judt's superb selection of biographical essays, The Memory Chalet. Declan Burke's 30 Shades of Great from his site Crime Always Pays highlights Tana French's Broken Harbour as 'the most frightening book I read all year', and Keith Ridgway's innovative Hawthorn and Child. The Globe and Mail has Margaret Cannon's Top 10 crime fiction books of the year, including the latest Donna Leon Brunetti novel, Beastly Things. Scott Pack's 'alternative' Best of 2012 on Me and My Big Mouth asks for contributions from readers - and there are lots of them, too. The Spectator's Books of the Year by regular contributors includes the much-praised biography of Henry VII by Thomas Penn, Winter King: the dawn of Tudor England (Sam Leith) and Richard Ford's novel Canada (Charlotte Moore). January Magazine has several lists, including Children's Books, Crime Fiction 1 (including Absolute Zero Cool by Declan Burke) and 2. John Self's Twelve from the Shelves include a novel he has championed a lot, Hawthorn and Child by Keith Ridgway, and May We Be Forgiven by A.M. Homes. The New Statesman: A Year in Books has among its highlights Zadie Smith's novel NW and Shalom Auslander's Hope: a tragedy.